Hokitika – The Great KiwiCombo Pass. See New Zealand your way! Who would think of putting whitebait on a pizza? Well, in Hokitika, a cool little seaside town on the West Coast of the South Island, a local chef decided to combine the local delicacy, whitebait, with an all-time favourite, pizza. The Hokitika River is a renowned whitebaiting mecca. During the whitebaiting season, which runs September through to November, intrepid locals can be found at their favourite hideout along the riverbank, whitebait net at the ready for these tiny, delicate fish to come swimming along. Most of the activity is at the river mouth, which is a short, easy stroll from the town centre, although there are prime whitebait stands all along the riverbank, discretely camouflaged amongst the foliage. Whitebait is highly prized and most baiters are content with providing this tiny translucent fish for friends, family and freezer. Others however have a more commercial eye, especially when it retails for NZ$100 per kilo! Back to the pizza. Take a fresh, soft pizza base, turned up a little at the sides, and smear it with garlic butter. Add a handful of whitebait carefully mixed together with a beaten egg and little milk. Season and pour over the pizza base. Generously sprinkle with capers. You get the idea, but leave it to the experts in Hokitika! Picture the late afternoon sun setting on the Tasman Sea, a rustic table overlooking the rugged stoney beach, a delicious whitebait pizza and a cold New Zealand beer. Or take it back to yourmotel. It doesn’t get better! Hokitika is a great place to spend a night or two, with outstanding alpine and ocean scenery, excellent local walking trails, the new Treetops Walkway, glowworm dell and world renowned greenstone factory where carvers create masterpieces from local jade. Your New Zealand holiday will be better for a stay in Hoki! If good food and wine is a priority for your New Zealand self drive vacation, plan your itinerary and stopovers so that you have time to relax and enjoy each destination’s specialities. This cool little West Coast town, Hokitika, has some outstanding walkways that are very family-friendly and breathtakingly beautiful. Hokitika is definately a cool little town. Located mid-way down the South Island’s West Coast, it delivers a genuine New Zealand small town experience. Not a traffic light anywhere, outstanding alpine and forest scenery, glorious sunsets, wild coastline and an equally wild gold-rush history. It’s easy to walk around and has a delightfully quirky beachside character. 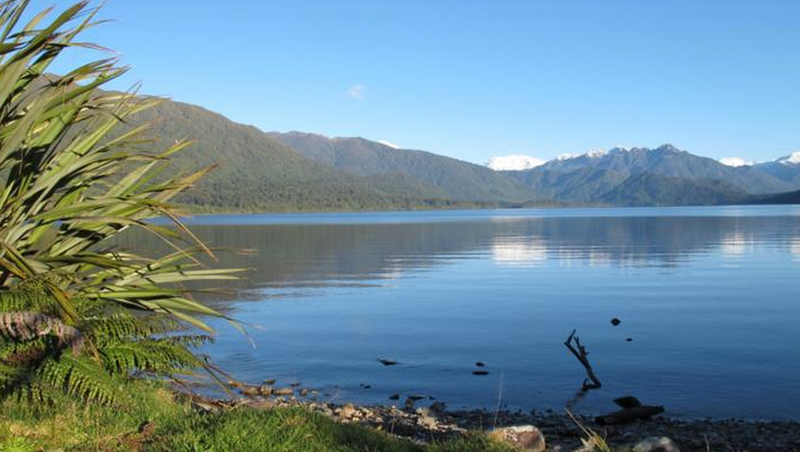 Lake Kaniere has to be one of the West Coast’s hidden jewels. Just 20 minute’s drive from Hokitika’s town centre, its crystal clear water and rugged snow-capped mountain backdrop provide perfect pictures without even trying. You can’t help but be a world-class photographer with scenery like this! Walk the lake shore, take the short 5 minute track through the rainforest to Dorothy Falls or seek out the nearby historic water-race walkway. It’s signposted at the lakefront and provides an easy walking trail for the family through regenerating forest and bush. The flat terrain is OK for little feet, but not strollers – at least not yet. It is currently being upgraded for easier walking and cycling and is a one way track. If you drive just a few minute’s south of Hokitika, you’ll come across a signpost and carpark for the Mananui Tramline. This historic tramline was used in days gone by to transport logs out of the forest. Now restored as a walkway, it’s flat terrain makes for easy family walking through forest and bush, with excellent boardwalks over swampy areas. One way it is 6km which takes approximately 2 hours, so pack a lunch and make a day of it. There are plenty of picturesque spots to stop and savour the outstanding views. Another option is to hire a mountain bike and cycle the trail which is great fun with a few downhill bits – watch out for the walkers though! 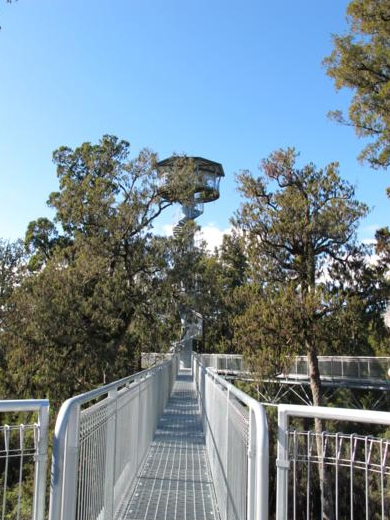 For a walkway of the manmade variety, the new Treetop Walk ticks all the boxes. Located just 15 minutes south of Hokitika, amidst the rainforest, it’s well signposted and offers cafe facilities (great pies! ), on-site parking etc. The walkway itself is 20 metres above ground level, with a tower that reaches 40 metres, and over 450 metres long. From the top of the tower there are breathtaking views of Lake Mahinapua, the snow-capped Southern Alps and horizon of the Tasman Sea. In my opinion, the best time for photos is mid to lake afternoon when the sun is behind you for lake and mountain photos. Just watch the time though, the last walk is 4.15pm (too early!). It’s great for the family, allow 45-60 minutes. If you rent a mountain bike and are up to the challenge of cycling from Hokitika, via the Mananui Tramline to the Treetop Walkway and return, it’s approx 38km round trip. An outstanding day out and you’ll deserve a cold West Coast beer at the end of it! At day’s end, top off your Hokitika visit with a glow-worm experience! Just on the town’s northern boundary, on the main road, you’ll see a signpost “Glow Worm Dell”. Well this is a wonderful surprise. After sunset take the 5 minute walkway into the grotto for the most amazing night-time wonderland. Thousands of tiny lights lit up to delight you. The track is well formed and there is a handrail to help guide you in the dark. The kids will love it. Hokitika surely is a small town that is big on character. This 21 day self drive itineraryoffers one night in Hokitika, but if you have time for a second night, then you won’t be disappointed. KiwiCombo Pass offers excellent flexibility so you can design your own self drive holiday with quality hotel or self catering motel accommodation, or we can create one for you. Hokitika is a very cool town, make the time!